Right, that's out of the way! In late december I made a plan for 2013, which would enable me to retain my CISSP certification while at the same time restoring my relevance to the IT job market. A few weeks later I got started on my ITILv3 studies, but those ground to a sudden halt when I chose an awful book to study from. A week later I started anew using the study guide by Gallacher and Morris, which is a great book! A month after starting the Gallacher and Morris book I took my exam using the EXIN Anywhere online examination. I didn't want to spend time away from the office to take this simple exam, which is why I went for the online offering. I'm very glad EXIN are providing this service! I thought I'd share my experience with the EXIN Anywhere method here. Booking the exam was a cinch, as you would expect. The online ITILv3 exam is only a little more expensive than the classroom version: €181 versus €170. The biggest benefit is that you can take the exam any time you would like, 24x7 during a month's timeframe after booking the exam. In my case I took the exam on a Saturday afternoon. No travel time required and no lost income due to hours spent away from my clients. Initially I was worried about the proctoring software that would be used during the exam, called Remote Proctor Now. This software was the reason why one of my colleagues opted to take the classroom exam, as he refused to have someone install software on his PC. I can confirm that on Windows software does get installed (I first tried the exam inside a Parallels virtual machine, which was refused because of cheating concerns), which I can understand someone being iffy about. However, on the Mac OS X platform the exam works a lot nicer: nothing gets installed, all you do is download a DMG which has the application in it, ready to run. I also provided EXIN with two pieces of feedback after taking the exam. During the setup phase, you are allowed to re-take your photograph and to re-take the photograph of your ID card. However, there is no option available to restart the room inspection. During my room inspection an error popped up from the proctor software which suggested that filming could maybe not be completed. But no definitive answer was provided and there was no option to restart the filming of your workspace. I sincerely hope I don't get failed on the exam because of this. The exam format is rather unfriendly, when compared to other computer-based exams. In essence it is simply a long HTML document with all the questions underneath eachother. Other testing suites (though admittedly offline) put the questions in much more user-friendly format. One question at a time, an option to mark questions for review, etc. 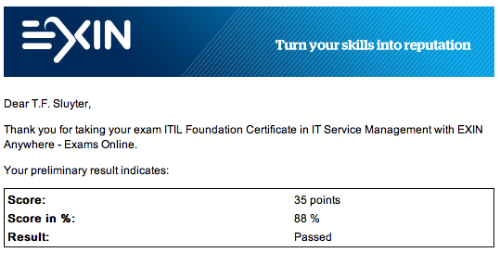 All in all I'm happy with how all of this went and it's certainly nice to have refreshed my ITIL knowledge. I last studied ITILv2 in 2001. The fact that it took me a month to study for this test worries me a bit though. The total prep time for ITILv3 was 15 hours (translating into 15CPE for my CISSP). I'm fairly certain that my RHCSA will easily take over 80 hours, which does not bode well. I reckon it might be somewhere between my LPIC and my CISSP studies when it comes to workload. If I want to achieve it within a reasonable timeframe, I will need to stick to a much stricter regime.